Mumbai is a city that never sleeps. From dusk to dawn, this city is thriving with activities. The real estate sector in Mumbai is booming with a number of residential and commercial projects through the city. Sunteck What a city is a lavish residential project in Mumbai by Sunteck Realty that offers a modern-day living that is simply out of this world! Spread over a land of 23 acres, this massive residential development is spread into 5 avenues. While Avenue 1 & 2 contain towers that offer 2BHK, 3BHK and 4BHK apartments with carpet areas stating at 579 sq. ft. and going up to 1100 sq. ft., you will also find commercial structures in the other avenues. A part of a 160 acre township, this residential development is packed with glorious features that makes it a mini-city on its own! You will find apartments that contain elegant fittings, large doors, wide balconies and windows providing beautiful views, superior flooring, and stylish kitchens with multiple provisions, intercom facility and other hi-tech safety features. This development also offers a fabulous range of external amenities that are crafted to offer leisure and comfort of the highest level! They include a clubhouse, swimming pool, well-equipped gym, jogging track, meditation centre, multiple sports facilities and a play-area for your kids, multipurpose hall, dedicated area for senior citizens, car parking facility, power back-up, firefighting equipment, retail outlets and 24x7 security. This development also takes up rain water harvesting. 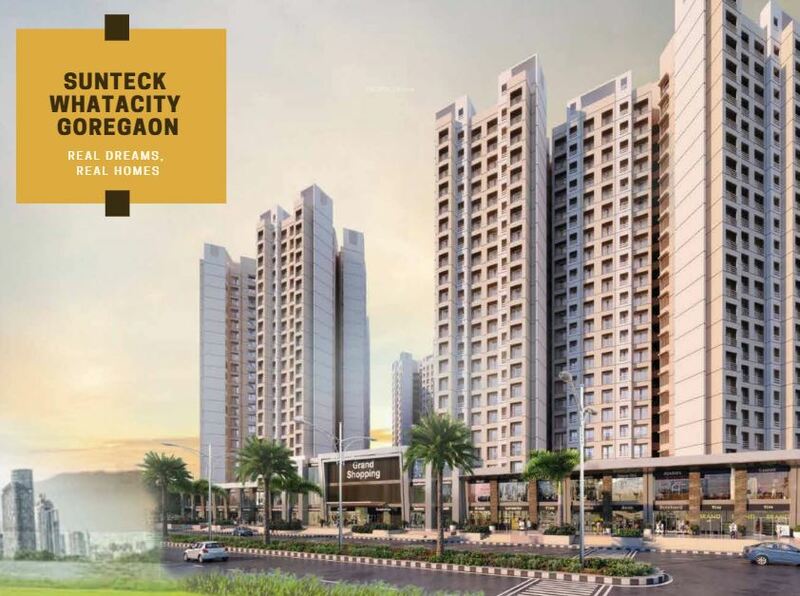 Situated a Goregaon in Western Mumbai, Sunteck What A City Goregaon has a number of landmarks in its vicinity and offers a life of convenience that will surely keep you satisfied. Places like schools, colleges, banks, ATMs, malls, shopping centres, retail outlets, convenience stores, supermarkets/hypermarkets, entertainment zones, cafes, restaurants, medical centres, hospitals, cinemas, clubs, pubs, resto-bars, lounges and a lot more can be accessed in the shortest amount of time possible. Starting at an amazing price of Rs.1.27 Cr. and moving up to Rs.2.42 Cr., the apartments at this development are budget-friendly and cater to the requirements of home buyers and investors as well. You can conveniently choose from multiple payment plans along with NRI services, home loans through well-known banks, customer support and more.